I scream! You scream! The police come! It's awkward! But, seriously, I love ice cream, even though it doesn't tend to love me back. B has a pretty severe lactose intolerance, so out of laziness, I just flat-out don't buy dairy products anymore. Yes, you read that right; I don't purchase dairy products because I'm lazy. 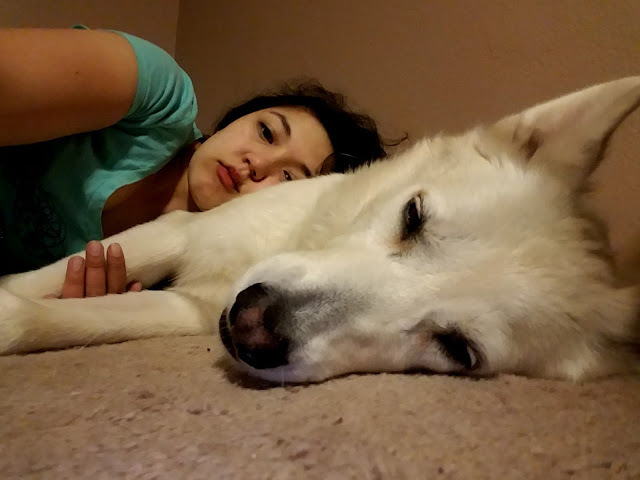 Yeah so we're a family of lumps. Wanna fight about it? See, I don't want to make the effort of cooking two separate meals at night, and dirty two sets of pans, just because I might feel like having a little butter on my pork chops. Frankly, now that veganism has made so many demands of food companies, I'm reaping the benefits. I can have cheese that melts and stretches and tastes like cheese. I can have butter that's not butter at all but still tastes like and behaves like butter when I bake it. Finding milk has been the actual struggle, but I find that the almond-coconut blends from SO Delicious and Blue Diamond have been the best matches for us. They're drinkable and tasty, and act quite similar to dairy milk in baking and pastry applications. I use the SO Delicious brand of coconut milk when I make ice cream, and it hasn't failed me, yet! 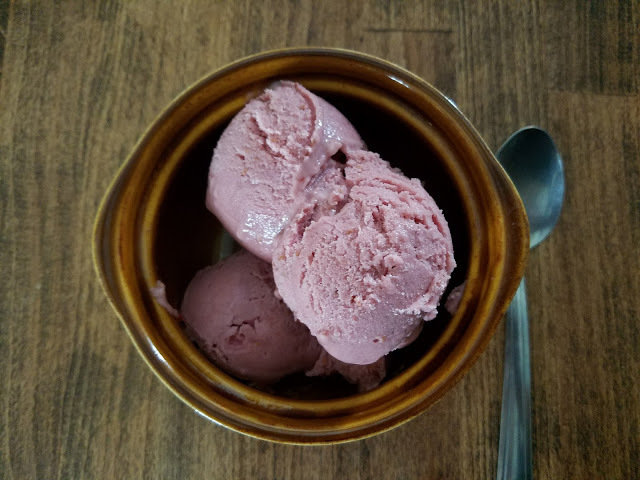 I made this flavor of ice cream because of a serendipitous find at the Overland Park Farmer's market in Kansas City, where I live. I like to go to the farmer's market on Saturdays and walk around, get fresh fruit, people watch, and maybe get myself a new bouquet of flowers from the very nice Vietnamese family at the end of the line. 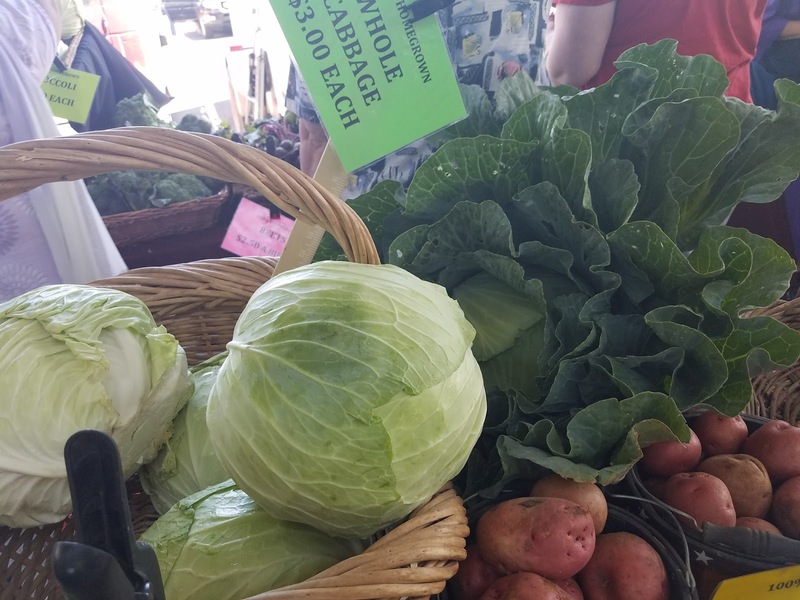 I'm extremely fortunate to have such a wonderful farmer's market near me; not a lot of people have it, and for that I'm truly grateful. There's a shop I sometimes partner with called The Tasteful Olive. They specialize in artisanal oils and vinegars, in just about every flavor you can imagine. Lemon olive oil. Blood Orange White Balsamic Vinegar. Chili Almond Oil. Oregano White Balsamic Vinegar. The list goes on and on, and I frankly couldn't even begin to fathom how they keep track of it all - but I'm grateful that it's there and I'm grateful that they do. 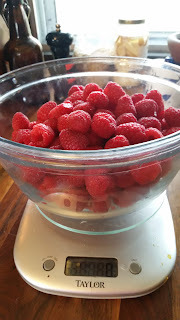 As it just so happens, the lady that I buy my berries from had fresh raspberries, and the raspberry balsamic vinegar I'd found at the end of the market was just too perfect-sounding to pass up. Now, I could make a raspberry balsamic vinaigrette for all of my salad greens when I got home, but where's the fun in that? Yes. You have to weigh the berries. Measure the coconut milk and then sprinkle the gelatin over the top in a single layer to allow it to bloom. Combine the egg yolks and sugar via whisk in a heavy-bottomed sauce pot. Whip until fluffy by hand, and then add in the bloomed gelatin along with half the coconut milk. Bring to 185 degrees F, whisking constantly, then remove from heat. Add the remainder of the coconut milk and the balsamic vinegar. Add in the raspberries and then puree everything in a blender. You may strain it, if you like, but I don't mind the seeds. Oh, and if you're not following me on Instagram, please feel free to! I show a lot of neat stuff on there, both from work and from home life. I hope you’ve enjoyed this post, and please let me know if you try out this recipe! Happy cooking and happy eating!